Damali Abrams the Glitter Priestess is a project-based artist who constructs spaces and experiences of fantasy and myth. Using collage, video installation, and performance, she explores Black Utopia through the lenses of Afrofuturism and Afro-Caribbean syncretic religions. Since 2000, Abrams has collaged images of black and brown mermaids to work through the inherited trauma of enslavement and to portray successful celebrities and people of color. Adorned with glitter, jewels, and crowns, the mermaids symbolize the attribute of wealth affiliated with the Watramama in Guyanese folklore. They also invoke the power of beauty as a healing practice. 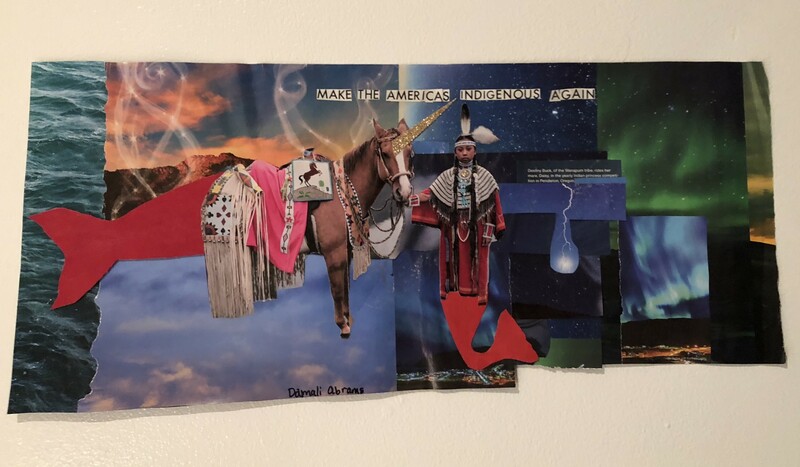 Make the Americas Indigenous Again transforms Destiny Buck of the Wanapum tribe and her mare Daisy into a mermaid and mer-unicorn. The title of the piece takes a critical stance towards the slogan “Make America Great Again,” and questions the meaning embedded in its rhetoric. Her collage exposes the false narrative behind the slogan, a phrase used in the 2016 presidential election to disregard the immigrants and enslaved indigenous people and people of color in America. The work calls for the empowerment while also bringing attention to the regalia that signify wealth and prosperity for the Wanapum tribe.